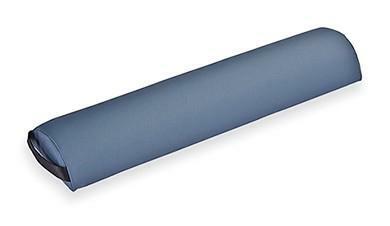 Living Earth Crafts Full Half Round Bolster - 3" x 6" x 26"
3" x 6" x 26"
All Living Earth Crafts (LEC) products are built with the utmost of care. If you are not completely satisfied with your LEC product and would like to return it, please contact your Sales Representative within 30 days of receipt for a Return Authorization (RA) number. Customers are responsible for return shipping costs and a 20% restocking fee. All returned items must be in new condition, in the original packaging with the original receipt of purchase. LEC will not accept a returned package without an RA number. Products returned to the factory damaged are the responsibility of the sender. Custom tables and custom accessories do not qualify for our 30-day return policy but are otherwise warranted as noted below. Table frames - Lifetime for original owner or 5 years after the model is discontinued. Living Earth Crafts (LEC) offers an industry best warranty, worldwide, on all tables and accessories. We guarantee our table frames against defects in material and workmanship for as long as the original purchaser owns the table, or five years after the model is discontinued. Foam and upholstery covering are warranted for three years. Hydraulic systems, motors, controls and actuators are warranted for two years, including parts and labor. LEC’s warranty service for stationary tables is offered on-site, where feasible. Accessories and options are warranted for one year, unless otherwise noted. LEC may repair or replace defective components at our discretion. For factory repairs on portables, the customer is responsible for shipping costs associated with returning the product to the factory. LEC will return the warranted product, standard shipping pre-paid, to customers in the continental US. International customers are responsible for any applicable duties and taxes, as well as all shipping charges inbound and outbound. Normal wear and tear, and costs associated with maintenance procedures, and damage caused by accident, misuse, improper maintenance, harsh operating environments or neglect (which includes tears in the upholstery and damage caused by harsh chemical-based cleaners) are not covered under this warranty. All warranties are limited to repair or replacement, at LEC’s discretion, unless otherwise stated. Please contact Living Earth Crafts at (800)358.8292 or (760)597.2155, or email us at techsupport@livingearthcrafts.com. Please have proof of purchase and the product serial number readily available to ensure expedited service. Your Living Earth Crafts table and accessories are carefully inspected, packaged in protective materials, and then insured against damage during shipment. To ensure full coverage, please inspect all tables for freight damage at time of delivery. If you notice any damage to the exterior of the box and/or the product itself, be sure to note all damages prior to signing the shipping/delivery paperwork, and notify LEC immediately.